Hiker John Stoneman, 57, was traveling through Kinzua State Park near Bradford, Pennsylvania with his girlfriend when he saw two large dark shapes moving in the woods. Curious, Mr Stoneman stopped his car in the middle of the road, even blocking traffic behind him to take a few snaps of what looked like two 7 foot tall beasts about 200 yards from him. The area has been know for Bigfoot sightings and the day before John captured his photos, a ‘Bigfoot calling contest’ was held as part of the bridge festival. Could there be a link? I have to say, hoax or not, those photos are great and the story seems more credible than many others. Check out the photos for yourself HERE! A local archeologist from the state department of Chhattisgarh in India is seeking the help of NASA and the Indian Space Research Organization or ISRO to identify what he believes to be ancient paintings of UFOs and aliens. The rock paintings are about 10,000 years old. The state of Chhattisgarh is renowned for its ancient rock paintings, mostly of humans and animals in everyday scenes. However, some archeologists are seeing ancient rock paintings that may depict something entirely extraterrestrial. 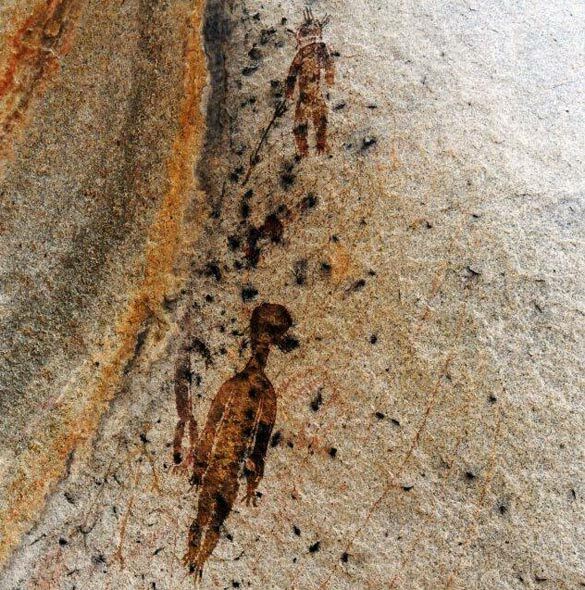 It’s not uncommon for ancient rock paintings in Chhattisgarh to feature strange beings. Some paintings feature mythical creatures including mermaids. According to Bhagat, the aliens and UFOs depicted in these ancient paintings bear a striking resemblance to those seen in movies, but he says the resemblance are likely to be just coincidence. Bhagat does admit that maybe the ancient drawings could be just a figment of imagination of prehistoric men. He says locals were worshiping some of the paintings. The “Rohelo people” are also telling local legends about the strange and entities that came from the sky. Rohelo translates to “small sized ones.” According to the Rohelo people, the flying objects came from the sky, took several people and they never came back. Bhagat says that the investigation on the ancient rock paintings is ongoing and he is seeking the help of other archeologists to determine the meaning behind these ancient works of art. 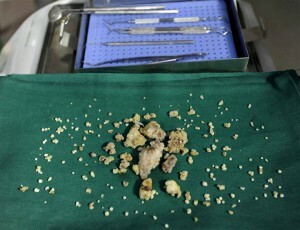 For today’s daily dose of WTF, a team of surgeons in Mumbai extracted an astonishing 232 teeth from an Indian teen. And the clincher? Surgeons said the operation was “fun.” Tell that to the teen who had to sit through six-hour of teeth extraction! 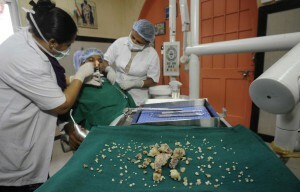 17-year old Ashik Gavai is suffering from a rare condition called composite odontoma. This condition results in benign tumors made of teeth-like structures in various parts of the lower jaw. The teen sought medical help because of a swelling on the right side of his lower jaw. His case was referred to the city’s JJ Hospital where Indian dentists extracted the cause of his swelling, all 232 of it. The tooth extraction operation to end it all went on for an excruciating six hours. According to doctors, Gavai’s molar tooth in his lower jaw grew into “hundreds of small teeth.” Because dentists at JJ Hospital could not remove the growth using traditional surgical tools, they resorted to good ol’ hammer and chisel. One by one, the teeth were removed and now the doctors are calling the whole spectacle a world record. Gavai’s case is unique because the condition itself does not normally result in 232 teeth. In fact, the maximum teeth extracted from a person with the same condition are only 37. Gavai comes from a poor family of cotton growers outside of Mumbai. Because they had no money for an operation, Gavai and his family turned to a state-run hospital to seek medical treatment. They obtained funds through a program that offer financial aid to poor patients. Gavai is currently recovering from his operation. The Baltic Sea made headlines this week after Mars, a cursed warship was uncovered after missing for 450 years. But the warship isn’t the only thing that rests beneath the depths of the Baltic Sea. In June 2011, a 60-meter circular rock formation was discovered on the ocean floor. The Swedish “Ocean X” diving team headed by Peter Lindberg and Dennis Åsberg discovered the strange formation. The Ocean X team reported that the rock formation was resting on a stone pillar with a structure similar to that of a staircase. The staircase-like formation was leading to a dark hole. Some commentators believe that the strange rock formations may have been a World War II anti-submarine device or a battleship gun turret. 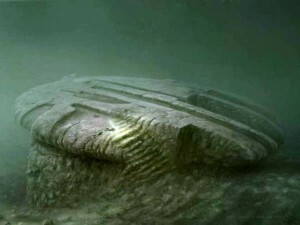 UFO experts believe the circular rock formation hidden in the depths of the sea may be a sunken flying saucer. Several experts stated the possibility that the structure may not be so alien after all; it could be a natural geological formation. Ocean X team came across the strange formation while searching for an old shipwreck. The group describes themselves as treasure hunters and salvage operators that specialize in recovering “antique high-end alcoholic beverages and historic artifacts” through underwater searches. According to the Ocean X team, the circular rock seems to be made of rough granite. The formation was approximately 3 to 4 meters thick and 60 meters in diameter. The pillar-like structure where the disc-shaped rock rests is 8 meters tall and located at a depth of 85 to 90 meters. A smaller structure, not too far away from the artifacts, resembles that of a runway. The runway-like structure is around a 300-metre (980 ft). The Swedish diving team recently published their discovery as well as additional close-up sonar scan on their Web site. On their YouTube page, Ocean X also uploaded a video of the structures in a 90-degree angle. The video gives a detailed view of the strange UFO-like rock formation as well as the eqyually intriguing structures near it. A massive, 400-feet long crop circle allegedly appeared overnight in a wheat field in the county of Dorset, South West England. While a number of crop circles were appearing in the area, this particular one is making headlines for its sheer size and the intricacy of the pattern. 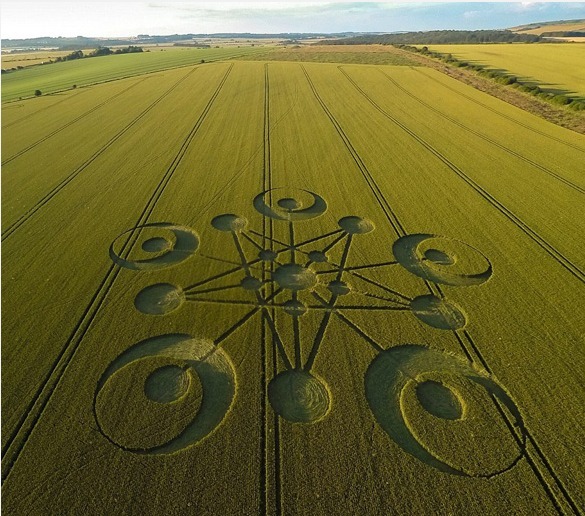 The crop circle in Dorset featured a star pattern with circles within circles. The perpetrator(s) behind the latest crop circle in England has never been found nor identified. According to Williams, crop circle markers rarely make them anymore because of the growing frustration of farmers over the loss of crops and tourists coming in to visit. Most crop circle makers are also afraid of paying hefty fines and thus, has stopped making the circles altogether. Williams himself paid £100 after being busted for a crop circle in 2000. He has since stopped making them not because of the fines but because he developed hay fever over the years. While most crop circles were obviously made by people, some circles, like the one seen over at Dorset, baffles the mind because of its size and how it appeared seemingly overnight without alerting people. Some wonder if the Dorset crop circle is made by extraterrestrials or have some other paranormal origins. NASA scientists confirmed that evidence of extraterrestrial life may be discovered within 20 years, in an announcement at its Washington headquarters this week. The space agency predicted that over 100 million planets in our galaxy could support life, suggesting that extraterrestrial life is possible to exist in any of these planets.